Reilly Rod Crafters, in collaboration with guide Debbie Hanson, has announced a new signature fly rod series. The Debbie Hanson Signature Series is a 7-weight rod, perfect for a diversity of fishing conditions. Estero, FL (October 24, 2018) – Women’s sport fishing advocate and freshwater fishing guide Debbie Hanson of Shefishes2 is pleased to announce the Debbie Hanson Signature Series fly rod in partnership with Reilly Rod Crafters of Palmyra, VA. The Debbie Hanson Signature Series rod features a flor-grade cork grip, titanium stripping guides, thread wraps at 16″ and 20″ for quick catch measurements, and has a complete lifetime warranty. 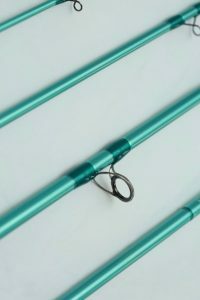 The metallic aqua blue blank carries the Debbie Hanson Signature Series Shefishes2 logo, comes with a lavender cloth rod sock, purple plastic tube for easy transport to your favorite fishing spots. Precisely placed alignment dots ensure that even beginning fly anglers can assemble the 4-piece rod quickly. The Debbie Hanson Signature Series True Seven fly rod retails for $289. For more information or to order the Debbie Hanson Series visit https://reillyrods.com/product/debbie-hanson-signature-series/ or check the list of Reilly Rod dealers online. For further information, contact Chris Reilly at (434) 989-8746.